Dawes, Charles Gates. 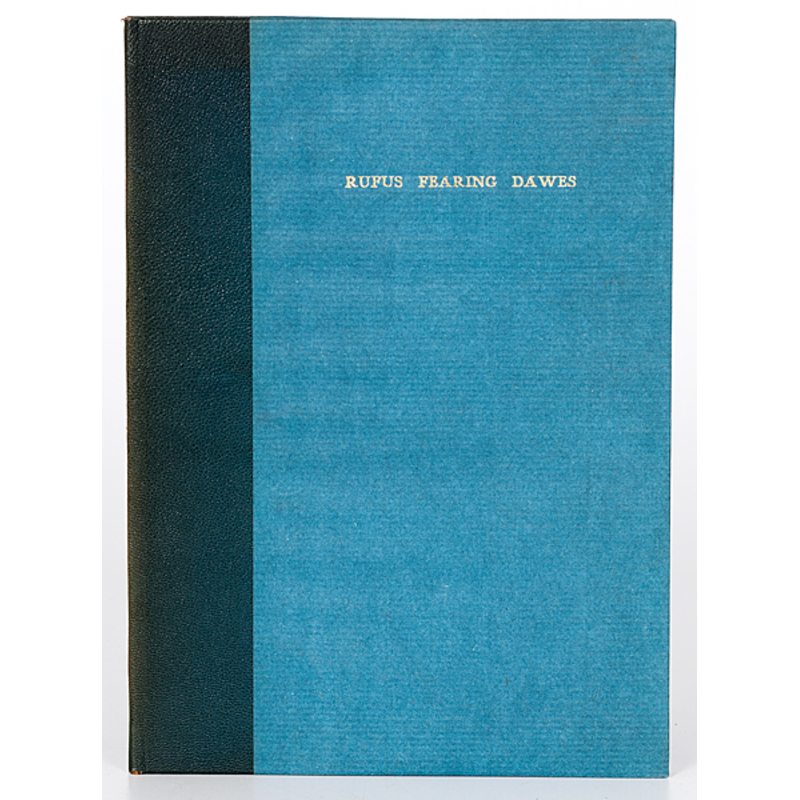 Tribute to Rufus Fearing Dawes. Read at the funeral by Rev. W.T. McElveen. [Chicago]: Privately published, . 4to, half-leather over handmade paper boards, gilt lettering on front, printed on handmade Italian paper, with tipped in half-tone of the younger Dawes, 12pp. (OCLC 9901006) A very nicely made tribute to a beloved son. Charles Gates Dawes (1865-1952) was a banker and politician. The great-great grandson of William Dawes (Rev. War, warned of British invasion with Paul Revere) and son of Brig. Gen. Rufus Dawes (6th WI, Iron Brigade), he was born in the sleepy river town of Marietta, OH. After working for McKinley's presidential campaign, he was appointed Comptroller of the Currency in 1898. He left that office to run for a seat in the Senate from Illinois, but lost because McKinley had been assassinated and TR supported Dawes' opponent. Leaving politics, he organized the Central Trust Company of Illinois where he served as its president for nearly two decades. During that period, on September 5, 1912, his only son, Rufus (b. 14 Dec. 1890), drowned in Geneva Lake during a break from Princeton University. Colonel and Colonel. In October 1918, he was promoted to Brigadier General. He served in France in the AEF working in purchasing and supply positions. After the war, Harding appointed him as the first Director of the newly created Bureau of the Budget, and he was appointed to the Allied Reparations Commission in 1923. His Dawes Plan was designed to help Germany restore its economy, for which he shared the Nobel Peace Prize in 1925. The plan did not work as conceived, and was replaced with the harsher "Young Plan," (which some would argue set the stage for a young Hitler). In 1924, the Republican's nominated Calvin Coolidge with little opposition. The first few Vice Presidential nominees, however, declined to run. Dawes was eventually chosen, and accepted the nomination against his earlier stand in which he swore never to enter politics again. After a couple of blunders in the Senate, his party decided to pass him over the following election cycle. He served a few years as Ambassador to the United Kingdom. He left the UK (after a few more blunders) to head the Reconstruction Finance Corporation (an independent agency of the government set up to financially support state and local governments in an attempt to stimulate the economy during the Great Depression). After accusations of preferential treatment with his former bank, Central Trust, Dawes resigned and returned to that bank to serve on the Board and, as chairman, try to rescue that company, remaining there until his death in 1951. Excellent other than sunning of the spine.